We wanted a place to share news and information about the various projects we are working on. 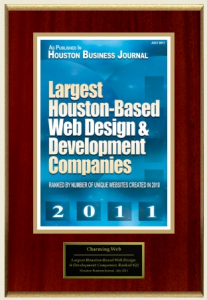 Charming Web is an award winning design company with many clients from the arts, entertainment, and business community. Our expertise has grown beyond just web design and blossomed into Social Media Management, Reputation Management, Search Engine Optimization, and Search Engine Marketing. We also manage Google services like AdWords and AdSense. We manage and design fabulous blogs using WordPress! We can customize WP for many uses and we are super advocates for this wonderful tool.